I assume what you're plotting at the moment is a highly-zoomed snapshot of initial transient behaviour, and that if we zoomed right out we'd see this time averaged apparent thrust average plus and minus to zero and settle to zero asymptotically as time->infinity. Remember that the force obtained from Meep and post-processed by Wolfram Mathematica as plotted is the net of the forces at the big and the small base. Shawyer is quoted as saying that there is no force on the lateral inner surfaces of the cone because the wave is spherical. This is clearly not the case. Actually the force on the lateral surface is even larger than the forces at the bases. Todd Desiato is 100% correct about this. I have verified this with a separate code I wrote that does not rely on Meep. Unfortunately I only have the csv files from Meep at the ends. I would need hundreds of Meep files to calculate the lateral forces from Meep, which is not manageable at the moment. So at the moment I am examining the results from my own code (that consider all the forces including the side forces). The great value of this communal effort using Meep is that although the net force just showing the forces from the ends does not take into account the lateral force, it does show different force distributions between different cases. It shows a big difference between the NSF-1701 NASA/Iulian Berca geometry and the what may be (or may not be, we have no idea) the Yang geometry, which is also the geometry that SeeShells is planning to run. It also shows the difference in stress and force distribution with placement of the antenna. It is also great to have independent confirmation from Meep to what I see in my different code, and if I see a difference, then that's something for me to explore. As to the balance of the forces, as I said I am running a different code, and examining how the forces are balanced. In the case of the Yang/Shell geometry (which is very close to a cylinder) they appear to be trivially balanced: the forces are balanced between the different components in the copper, and that's it, like in a cylinder. For NSF-1701 they don't appear to be trivially balanced and they involve other things as pointed by Todd, Ricvl and others. I completely disagree with those that claim that there is nothing to be learned from solving Maxwell's equations for a truncated cone and calculating the stresses. On the contrary, the solution is not trivial. Even Greg Egan (who only calculated the energy density) showed that the stress distribution is non-trivial. One thing I admit I'm not seeing from these simulations is the huge amplification factor that is claimed from Q, the forces are lower than from a photon rocket, just like Marco Frasca found out. So, Todd is in the right track about worrying about where is the amplification coming from ? is it an artifact? or is it produced by something that goes beyond Maxwell's equations? Wouldn't any theory of EM drive that involves a fourth spatial dimension — one that's not infinitesimal – necessarily place us in ultrahyperbolic spacetime? Which I've always thought was a rather bad spot for physical constructs dependent on consistent laws. That was always my understanding going back to Klein. No extra spatial dimensions for you! Not unless those dimensions are bound in a compact manifold making them about as easy to access as other parts of the multiverse. But hey, I've got my own heresies. I'm still a fan of the idea that dark matter is just probabilistic gravity leakage across branes rather than some invisible stuff in own universe. It notonly seems neater that way, it blows open fun doors in information theory. Read up on the Randall/Sundrum theory that places a short finite length dimension between our brane and a gravity brane, attempting to explain why gravity is so relatively weak. I seem to recall Randall had proposed some CERN experiments to watch for momentum being transferred to/from extra dimensions. Does anyone know if those are still on the books? There is an event a CERN next week to discuss the issue and other implications of string theory. Researchers will be able to try to find any evidence of extra dimensions in the LHC runs. I hope they find something, but Nature may not cooperate. It would be a shame if string theory and super symmetry are incorrect. Decades of work has gone into them, but that doesn't mean they are correct. Can you address this time window speculation of mine please? And yes, I do understand that since you're not including sidewall forces, then you will get an apparent net force directed big end forward. You are seeing the last 14 time slices of a total of 320 time slices of transient behavior representing (from what I recall) 0.013 microseconds since RF feed ON. A "time slice" in seconds is what? Going from memory here. The info can be ascertained from previous messages. Time consuming to retrieve it. Remember Lifters? They drove the woo community nutso with excitement until it was discovered they worked on an ion wind principle. But this didn't prevent every crackpot theorist with internet access chiming in with their pet theories. What is interesting is how these folks responded after it was discovered that the Emperor had no clothes. They didn't. They just walked away, silently, trailing their tattered mathematics behind them. Now, if you have a theory that definitively predicts EmDrive thrust, and it is later shown that no such thrust exists because all measurements are experimental artifacts, what are you going to say about your theory, now clearly wrong? What suddenly changed to make it wrong? - nothing changed in the mathematics! Will we see any post hoc explanations? Will theories be publicly abandoned? Usually this is never the case. In an ideal world, the faulty assumptions are isolated, identified and discussed. You don't need to go to fringe science for that. Physics is littered with mathematical theories proven wrong. Most mathematical theories are eventually proven wrong or if they survive, they only do so as approximations (Newtonian mechanics being a very useful approximation to the ultimate reality). You don't even need to go to mathematical theories. When Quasars were first found one of the earliest theories is that it was extraterrestrial intelligence communications. CTA-102 was catalogued in the early 1960s by the California Institute of Technology [where Sean Carroll teaches], and proposed, in 1963, by N. S. Kardashev in the scientifically conservative Astronomical Journal of the USSR as evidence of a Type Two or Type Three Kardashev civilization. A worldwide sensation followed a TASS agency announcement that Gennady Sholomitskii of the Sternberg State Astronomical Institute, following up Kardashev's idea, had found CTA-102 to be the beacon of a "supercivilization". When Quasars were first found one of the earliest theories is that it was extraterrestrial intelligence communications. .. and for all we know they still are. Given that NASA is going to demonstrate using pulsars as navigation beacons, strangely prescient. @Rodal. OK ~40 ps/timeslice. 2.45 GHz period = 408 ps. So 10 ts/period - probably precisely. It needs to be precise i.e. an integer number of timeslices per period. Your logic is correct. The assumption that the frequency is precisely 2.45 GHz is incorrect. Interesting calcs digging through the data of Prof Yang. When her team redid the measurements from the dip in their Force curve, as I reported earlier, they adjusted their data to show a 4N/kW result. The cavity they used had a measured Q of 1,531 because it needed a wide bandwidth to try to swallow all their magnetrons output. Adjusting the 4N/kW value to a cavity with a Q of 117,500 (their latest design) the Specific Force would grow to 307N/kW. Playing with the cavity Df to get it to 0.95 and still having the 117.500 unloaded Q would maybe boost it another 50%. Then ripping out all cryo cooling, reducing tank sizes, leaving only what is needed to drive the fuel cells, TWTAs & EMDrives, reducing the frame to a non space, non ablative entry airframe, no wings nor tail, the Spaceplane's, now a wingless Drone, mass would probably drop at least 50% to say 5t which would need 50,000N to lift off. Would require 163kW of Rf at 307N/kW, so the existing fuel cells and TWTAs could power the 5t drone. Which suggests it may indeed be possible to build a non superconducting EMDrive powered 5t drone, based on the work already done for the Spaceplane and using the latest Prof Yang high Q cavity design being feed with a narrow band Rf signal that auto tracks cavity resonance changes. As the 5t gross takeoff mass includes 1t of cargo mass, it would not be that hard to put a pilot, a few paxs and cargo in that airframe as the LOx and LH2 tanks will be reduced very significantly as no cryo cooling will be required. Yes I know it is just speculation but the numbers do stack up and numbers that stack up make an engineer's gut happy to say, Yes it may be doable with enough engineering hours and funds. 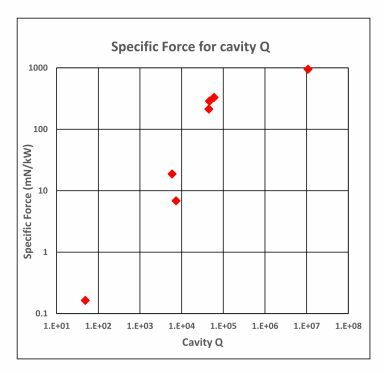 BTW I'm starting to think the Tajmar experiment was meant to provide Shawyer with a low point Q value to add to his Q versus Specific Force chart. The excitation drive center frequency is precisely 2.45 GHz and that is used in making the time slices. The Gaussian noise bandwidth is 0.025 * 2.45 GHz so the cavity is free to resonate where it will. Aircraft engines are very noisy. Even if you cannot see a reconnaissance drone you just have to hear it to shoot it down. If the EMDrive is quiet it would be permit a major increase in audio stealth. Alas, for the good 'ol days, when gentlemen of Planck's caliber settled matters at kinetically at 10 paces. To help in this question it deserves a look the Gerald Kaiser work "Electromagnetic inertia, reactive energy and energy flow velocity" http://iopscience.iop.org/1751-8121/44/34/345206/ and subsequent works by others easy to track in Thomson Reuters WoS. But there is no way to transmit wavelets, unless using a extremely wideband linear amplifier and antenna (fractal antenna?). Very interesting papers by Kaiser. Very timely post. Thanks! Swirling electromagnetic waves, as with air, could create suction in the direction of the narrow end of the vortex. Thus, I've been reluctant to quantify the force as "thrust". Visualizing what occurs in a non-static frustum lead me to explore some papers on a electromagnetic vortices . Be aware, there are 4th dimensional properties going on here and its not for the faint of heart. Meepers will no doubt have issues with 4th dimensional properties as well as non-steady state EM waves in a Rotational propogation...just what fires naturally out of a magnetron's radome. There you have it. Its where I'll be spending my theory time. Comments and critiques welcomed. p.s. Yes, I know, a Z axis rotation needs to be measured along the longitudinal axis. To date, no one has tried this. It's probably a good thing I read through the paper and looked up some of its references, before I came across further references to scalar waves, Tesla, Bearden. At least none about free energy and Keely-net. Nevertheless, one does find references to such in qm, and the fine structure constant uses high-order terms also, which is necessary to describe atomic matters, where electrons don't radiate away momentum and spiral in. Something does seem to be missing with the Heaviside's dumbing-down of Maxwell's quaternions if atomic phenomena are to be explained electromagnetically. Thanks for the post. Gives me something to think about, and a reason to come back. Good luck with your build!